Fast growth is encouraged by mixing a balanced organic fertiliser into the soil before planting. In midsummer, drench plants with a liquid fertiliser to stimulate late-season blooming. Upright nicotiana combines well with mound-forming flowers like portulaca or lobelia. Many varieties are fragrant. Very tall varieties benefit from staking. 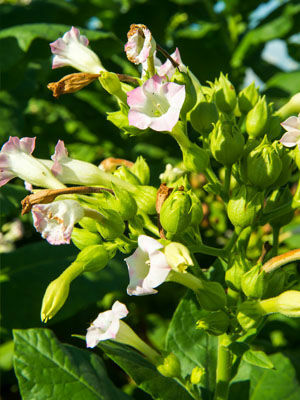 Nicotiana colours include white, pink, red, purple, lime green and yellow. Aphids and slugs can require management. Some people are sensitive to nicotiana leaf sap and should avoid contact by wearing gloves and appropriate clothing when working around the plants.